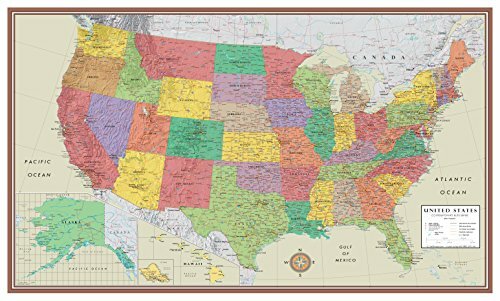 48x78 Huge Mega United States USA US Wall Map Contemporary Elite Edition Poster. This elegant, richly colored antique-style United States Contemporary Elite Series map features the incredible cartographic detail that Swiftmaps.com has been known for. The map features a Miller Projection, which reduces distortion of land masses as they near the poles. Printed on 36lb top-coated poster paper years of enjoyment! Only the best from Swiftmaps.com line of quality wall maps!! Perfect USA map for business, home or educational use!